On the 23rd of November 2018, a prize-giving ceremony was held in Paris to reward the four winners of the second EDF Pulse Africa competition, the purpose of which is to identify and support African innovators committed to growing the continent’s energy sector. 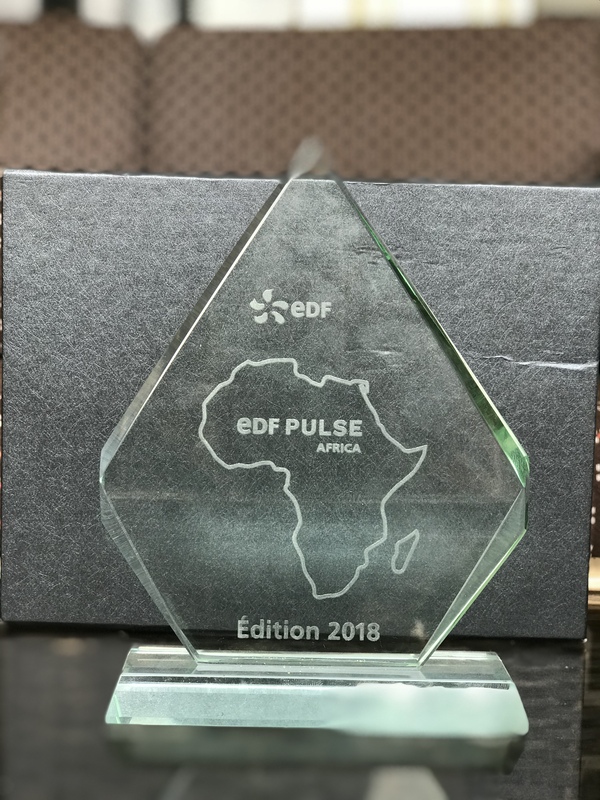 Having attracted 4 times more entries than last year, EDF Pulse Africa has confirmed the momentum of African start-ups and their interest in EDF’s support. Savanna Circuit Tech Ltd. submitted a solar-powered portable milk-cooling system. This system reduces milk losses, which are highly detrimental for small-holder farmers and which are due to transportation distances and the absence of preservation infrastructures. The system also helps to combat food insecurity by eliminating the risk of bacteria proliferation. In addition, the solution comprises a platform which can be accessed by smartphone and which enables milk producers to maximise their profits. This start-up from Ghana specializes in the development of mini-grids. The company already operates 15 of them in Ghana and aims to connect more than 12 000 Ghanaians to the grid by the end of the year. The system has a very high capability factor (over 98%) and allows clients to track their energy usage and pay their bills via smartphone. The customer relation platform is flexible enough to meet a wide range of customer needs and apply customized time-of-use tariffs. SolarCreed provides Nigerian poultry farmers with solar-powered lighting systems as a replacement for fossil-fuelled lighting systems which accounts for 30% of farmers’ operation costs. Using solar panels, long-life lithium-ion batteries and LED lamps, this system provides up to 10 hours of lighting. Water Access Rwanda has developed a solar-powered kiosk for the distribution of drinking water. It comprises a water treatment and distribution device called “INUMA”, powered by solar energy and equipped with a powerful filtration system. One INUMA kiosk can provide 2 500 people with purified drinking water. In addition, the INUMA kiosk also serves as a sales outlet for sanitation products, filters, chlorine tablets and telecommunication services, as well as savings and micro-finance systems. Specializing in aquaponics (a food production system that combines aquaculture with agriculture) this start-up designs kits, for individual and professional clients, that use fish waste as fertilizer to grow organic food. The product is powered by solar panels ; it requires 10% of the amount of water used by traditional farming methods, reduces the amount of impurities in fish water tanks by 90% and eliminates the use of chemical fertilizers. Access to EDF’s innovation ecosystem: EDF’s R&D function and creativity labs. Supporting innovation by involving local businesses in the development of innovative offerings. The EDF Pulse Africa initiative follows on from the EDF Pulse awards which, since they were launched in 2012, have already helped to spotlight and support 1500 innovative projects developed by start-ups in France, the UK and Italy. Marianne Laigneau, Senior Executive Vice-President in charge of EDF’s International Division and Chair of the EDF Pulse Africa jury: The success of this second EDF Pulse Africa competition confirms the appeal of EDF’s support programme. The incredible wealth of submitted projects reveals the entrepreneurial potential of Africa’s youth, who are bold, innovative and perfectly attuned to the continent’s challenges. We are proud to be encouraging these particularly inspiring initiatives, which will form an integral part of tomorrow’s energy solutions and which match the momentum of our business portfolio in Africa.